These Connecticut clients wanted a very Old World English Country Bedroom for their 18th Century renovated Country Farmhouse Retreat in central Connecticut. Unfortunately the age of these old Ct homes often times don't have the ceiling height that a designer loves. Rather than linger on an architectural " drawback ", a good designer will " work with it " and turn the " problem : into an asset. 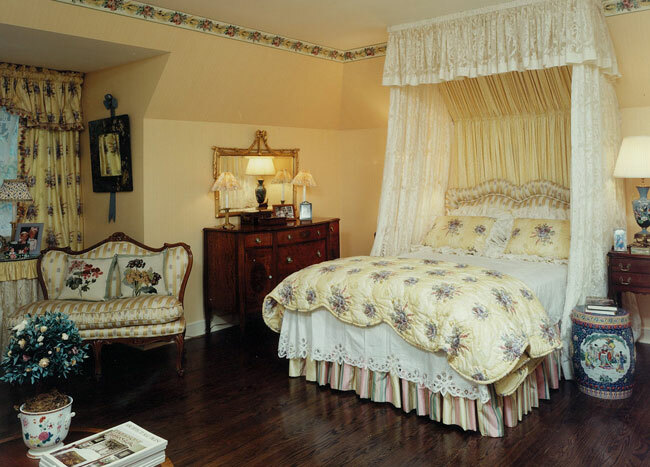 In this particular case I played into the low ceilings making my buzz words be cozy and warm.Trying to maintain a level of elegance farmhouse sophistication, my goal in this Connecticut home was to create the ambience of an English Country Bedroom. The Antique Mahogany Secretary with satin wood inlay on the top was purchased in an Antique Shop in Greenwich, Ct. Perhaps difficult to ascertain in the photo, but the drawer pulls are made of Ivory. Secretary is turn of the century American. Lamp was a miniature Staffordshire vase that I converted into the lamp that you see.